First visit of Bond, 10 year old Siberian cat, at our clinic was due to recurrent obstruction of the lower urinary tract, treated at different clinic. First clinical signs occurred two years ago. 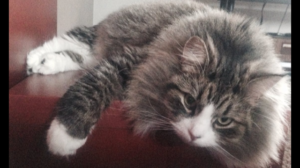 Bond had been catheterised for one month, but it hadn’t resulted in any improvement. When the catheter was removed, the obstruction showed up again. Surgical removal of deposits in urinary bladder (confirmed by an ultrasound) was considered, but because of Bond’s bad general condition, azotemia and progressive severe non-regenerative anemia it was suspended. Proposed treatment consisted of antibiotic administration, intravenous fluid therapy and gastroprotectants. Administration of drugs that stimulate erythropoiesis was also started, and the day before visiting SpecVet one unit whole blood was transfused. During the first visit (one day after blood transfusion) Bond came in with urinary catheter. Earlier, every time when catheter was removed, the obstruction immediately reoccurred. 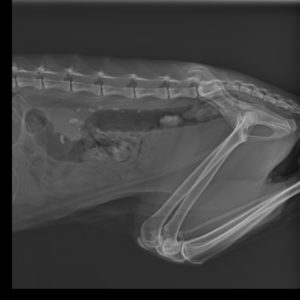 General condition of the cat was bad, he had pale (almost white) mucous membranes, generalised weakness and muscle atrophy, emaciation, hypotension and hypothermia. Systolic arterial pressure (SAP) was 90, 92, 95 (Doppler method). Pulse was difficult to measure (more than 200 beats per minute) and the temperature was 37°C. Patient weighted 3,5 kg. Smell of urea from mouth was noted, and hair was dirty and dull. At the ultrasound we noticed filled urinary bladder with thickened wall, cloudy urine and kidneys with visible mineral deposits. In the left kidney there was a large number of reflecting mineral deposits, and one big deposit in the right kidney. What is more, there was a visible accumulation of fluid in liver and pleura areas. After 3 hours of treatment, body temperature increased to 38,8°C, and SAP raised to 110. We decided to repeat blood transfusion, administer iron supplementation intramuscularly and continue treatment of anemia. Antibiotic therapy and fluid therapy was also continued. Bond’s condition improved quickly and after one week it improved enough to perform surgery. Because of the presence of mineral deposits in kidneys, which were continuously descending to urinary bladder, we decided to perform urethrostomy to shorten and widen the urethral lumen. Thanks to that, urinary stones, although still existing, were easily excreted with urine without pain. During urethrostomy there was no complications and the recovery was quick. After the surgery chronic treatment was initiated, which main principle was to counteract azotemia and development of urinary caliculi in kidneys. We recommended long-term fluid therapy, anti-inflammatory drugs and low-phosphorus renal diet, which was considered as an important element of treatment. Several follow ups confirmed good and stable condition of the patient, who’s body weight increased by 1 kg, and renal parameters remained low, almost normal for over a year. Unfortunately, Bond showed up again because of bad condition, loss of appetite and weight loss. At the beginning we started with conventional treatment, but Bond’s condition was not improving. On the ultrasound we found left kidney hydronephrose and a lot of deposits in left ureter visible on x-ray. Because there was no more medical treatment possible, it was decided to perform a surgery. 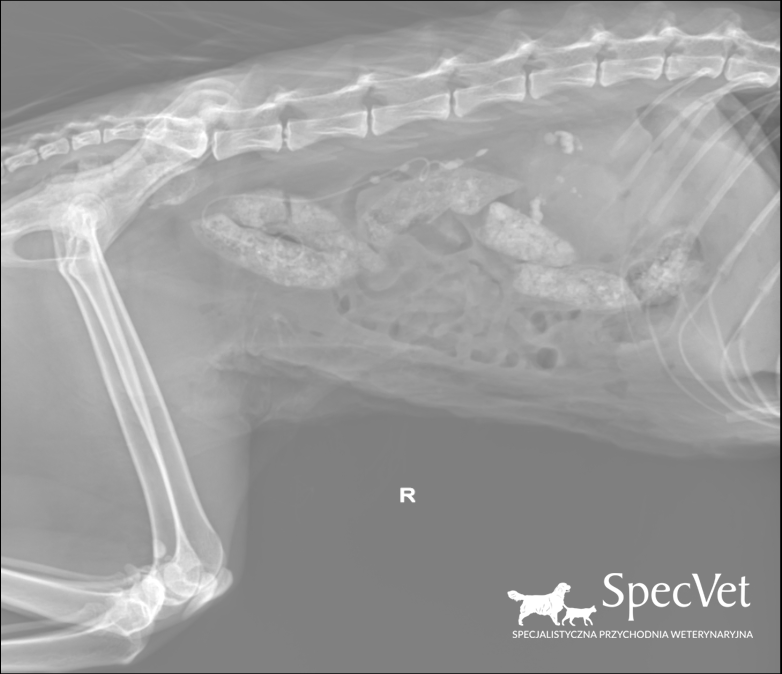 In case of ureteral obstruction (one-sided or two sided) in cats, there are two surgical methods available: double pigtail ureteral stent and Subcutaneous Ureteral Bypass (SUB). In Bond’s case we decided to introduce double pigtail in accordance with UC Davis method. It consists with introducing the polymer catheter into the lumen of ureter. Catheter is fixed to renal pelvis and urinary bladder. It enables free passage of urine from kidney to bladder. Beside difficulties caused by the presence of many depositions in renal pelvis and ureter, we managed to introduce the stent, which will stay in the organism. General condition of patient during the surgery was good, however bacterial growth was visible in the culture from renal pelvis. After administration of targeted antibiotics, renal parameters as well as patient’s general condition improved. The prognosis is good.